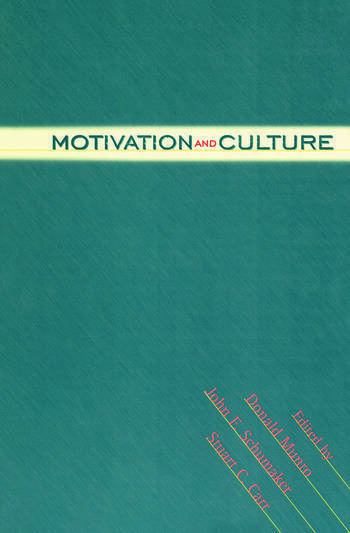 Although a growing number of researchers emphasize the social and psychocultural aspects of motivation and motivation theory, few books have provided much coverage beyond well-tread studies of physiological and biological factors and theories. Motivation and Culture brings together eighteen writers with a variety of academic backgrounds and cultural experiences to explore the way that culture impinges on motivation. Exploring topics such as personal values and motives, intercultural exchange in the workplace, the intrapsychic process and the nexus between biology and culture, they formulate theories of motivation that can be applied in the modern multicultural world. Contributors include: Dona Lee Davis, Russell Geen, Joan Miller, John Paul Scott, William Wedenoja, Elisa J. Sobo and Stephen Wilson. 14. John Paul Scott --Aggression, Violence, and Culture. Donald Munro, Stuart C. Carr and John F. Schumaker are Senior Lecturer, Lecturer and Senior Lecturer, respectively, all in Psychology at the University of Newcastle, Australia.